UCOG Today [Paul Kieffer] » Blog Archive » The south rises again! Spring is a beautiful time of year in the deep South. Of course, spring is a beautiful time of year anywhere in the world, but especially so in an area where azaleas are found in abundance. 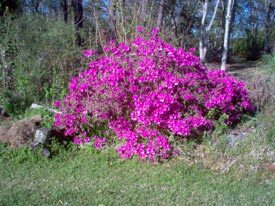 Mobile, Alabama is famous for its azaleas, and they are a brilliant blaze of color by mid-March. The one in the picture grows in our yard, unattended, along with several others. You see azaleas all over the city, and their color and the warmer temperatures are confirmation of the rebirth of nature and the end of winter – what little there is of it down here anyway! For you Northerners – both in the USA and in Europe – daytime temperatures here these last two weeks have been in the 60s and low 70s (20C).